Published in Forbes (March 27, 2019). Last week, Alberta’s premier called an election in the Western Canadian province, following a years-long economic downturn due to depressed global oil prices — which have dominated discussions about the province’s energy and economic future. Albertans increasingly recognize that business as usual is not a likely road to continued prosperity with changing global economics, raising questions about how the province’s energy policies should reflect this shift. In the midst of this ongoing public debate, the Pembina Institute and Energy Innovation have released a new interactive tool. 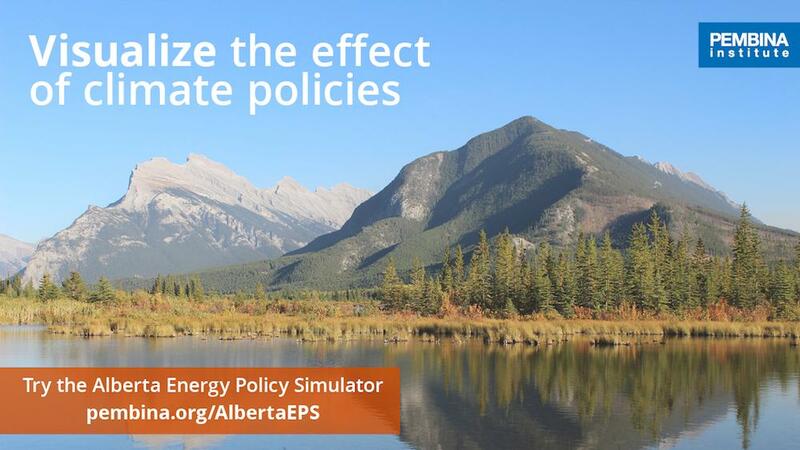 Alberta’s Energy Policy Simulator (AB-EPS) demonstrates a few no-regrets policies could cut the province’s emissions by nearly 30% while saving more than $6 billion a year by 2050 and advancing its energy policies in a changing energy future. This tool helps put energy and climate policy discussions into perspective. For the first time, anyone can evaluate the combined impact of more than 50 energy policies on greenhouse gas emissions reductions, economic costs or savings, and human health impacts. Alberta needs a renewed energy policy vision to remain prosperous in a fast-changing world. If this vision builds on a shared understanding of the issues at stake and includes credible climate policies that spur sustainable development, it can protect economic competitiveness and put the province on track to contribute to Canada’s emissions targets. Numerous forces are straining Alberta — whose economy was once heavily reliant on its oil and gas resources — starting with declining predictability of demand for oil and gas products. The United States was once the province’s largest oil and gas customer, but has now become its biggest competitor. Fast-falling renewable energy prices and rapid vehicle electrification are two of many forces reshaping energy demand. And the worsening impacts of climate change have created an imperative for the world to decarbonize its energy systems and drastically reduce climate-destabilizing emissions. Alberta has a unique equation to solve. As a resource-based economy, it must craft a plan to maintain and diversify an economy with its existing natural and renewable resources while transforming its industries and energy systems to ensure they are competitive in an increasingly decarbonized world. Lowering our emissions is equally as important for provincial prosperity as it is for ensuring the province is not a barrier for Canada as a whole to meet its objective of reducing carbon pollution by 80% by 2050 below 2005 levels. As non-partisan, science-based organizations, the Pembina Institute and Energy Innovation launched the AB-EPS to provide policymakers and citizens with a platform for informed discussions about Alberta’s energy policies. The AB-EPS builds upon the Canadian EPS model launched in 2018. The new tool visualizes the cumulative and interactive effects of more than 50 energy and climate policies across all sectors of the economy: electricity generation, transportation, buildings, industry, agriculture, and land use. The AB-EPS is adapted to reflect the complex realities of Albertan energy policy, allowing everyone in the province to test policy ideas being discussed in the public arena. The EPS demonstrates Albertan and Canadian policies implemented since 2016 have helped Alberta significantly reduce its carbon pollution — while being the Canadian province with the fastest-growing GDP. 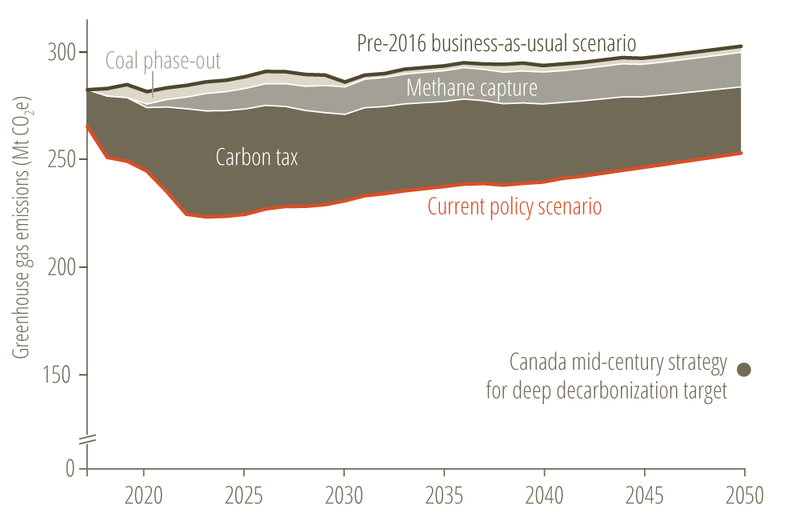 Figure 2 shows how a combination of smart carbon pricing, plans to capture leaking methane emissions from oil and gas operations, coal plant retirements, and ramping up the province’s plentiful renewable energy resources has tangibly shifted Alberta’s emissions trajectory. But even with these gains, additional action is needed to ensure economic prosperity, and Albertans’ quality of life — while continuously reducing emissions. Alberta must implement a smart combination of energy policies that address the emissions sources with the most room for improvement; no one policy can do it all. While all sectors of Alberta’s economy generate emissions, roughly three-quarters of the province’s total emissions came from two sectors in 2016: industry (55%) and electricity generation (17%). Addressing methane leakage is one example of an effective policy with a large potential. Methane is a potent greenhouse gas with more than 28 times more warming potential than carbon dioxide, and leaking methane from oil and gas operations accounted for 16% of the province’s 2016 emissions. Capturing these leaks would be one of the most cost-effective ways of reducing Alberta’s emissions while conserving resources to ultimately benefit the provincial economy. 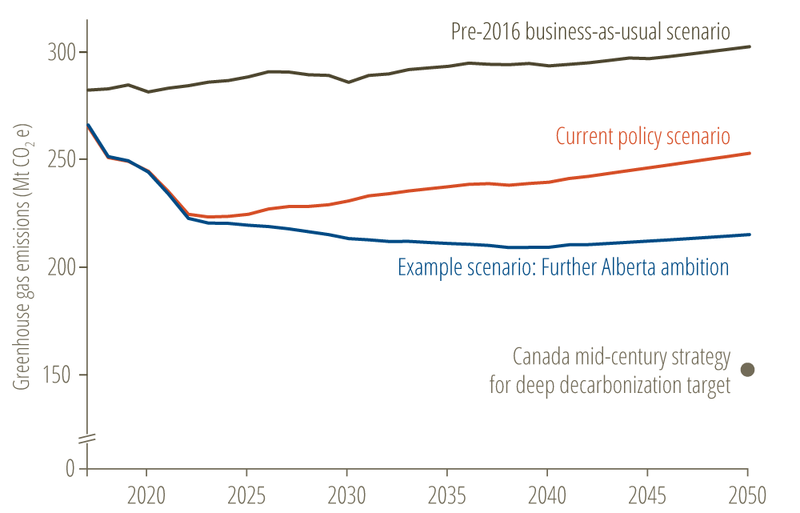 Developing more of Alberta’s abundant renewable energy potential, phasing in net-zero buildings by 2030, and expanding public transit options are additional examples of beneficial policies that could cut the province’s emissions by nearly 30% (as shown in Figure 1) while saving more than $6 billion a year by 2050 through efficiency gains and fuel costs savings. Solutions of this scale aren’t out of reach; Albertans have a track record of addressing complex challenges. It took vision and determination from the provincial government in the 1970s to invest public resources into the research and development that served as the basis of the oil sands industry. Only a few decades later, Alberta once again needs renewed vision to remain prosperous in a fast-changing world. It’s clear that increasingly cleaner energy is the new reality, and investing in that future through smart policies can steer us in that direction. Such visionary approaches typically require an upfront investment, but we know from experience that these investments pay off. Tools such as the AB-EPS allow us to reality-check proposed visions for Alberta’s economic and energy future, allowing for a fair and accurate comparison of varied plans, or to encourage decision makers to adopt stronger plans. The AB-EPS can help Albertans recognize the significant economic, climate, and public health benefits inherent in energy policy, and to ask the right questions about the solutions our political leaders are proposing to ensure we can thoughtfully steer Alberta in the right direction. Ultimately, Alberta’s citizens deserve an economic vision compatible with the reality of the 21st century. Megan Mahajan is a policy analyst at Energy Innovation. Benjamin Israel is a senior analyst at the Pembina Institute. This article originally appeared in Forbes on March 27, 2019. Tags: Alberta, Provincial Policy, Climate Policy, Economics. Benjamin Israël is a senior analyst with the Pembina Institute. He is based in Calgary.